thrifted like the wolf sweater (with a side of priorities) | i made it so. i rarely buy clothing second-hand. it’s not because i’m a snob. i rarely buy clothing at all. have you tried that whole change-room thing with little ones in tow? if you have, you’ll know what i mean. if not, then i’m sure you have a fabulous wardrobe. by “fabulous”, i mean pretty much anything beyond my these-yoga-pants-and-this-tank-top-are-faded-enough-to-match-right? 5 checkmarks and i’m on top of the world! watch out. as i was saying…i rarely buy second-hand clothing. i’m too busy hunting for vintage pyrex or falling in love with old couches like a ninny. but this summer, i traveled out to toronto and visited the old stomping grounds of kensington market. if you ever visit toronto, take time to seek out this little neighbourhood. there are fresh open markets, curious little mom and pop shops, the best cheese store in town, a yarn shop, little cafés and restaurants nestled away, and a scattering of reasonably priced vintage clothing stores. in one of those shops there, i found a sweater that i could not resist. it’s black, with diagonal yellow stripes à la platinum blonde. need i say more? i’ll say more — made in canada. sadly, that is a rarity these days. 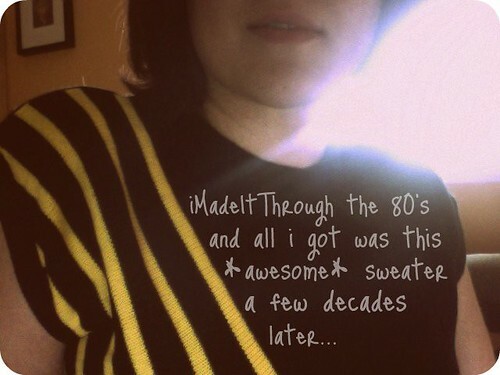 This entry was posted in canadiana, thrifting & vintage and tagged my priorities, platinum blonde, thrifty sweater, vintage 80s sweater, where'd i put my pants?. Bookmark the permalink. i take ‘am I wearing pants’ a little more seriously – mine is ‘am i suitably dressed’ – i don’t wanna be wandering round the shops in my jim jam pants! We forget pants here all the time. You go, Pat Benatar! I’m terrible about NOT trying on clothing at thrift stores, but buying items anyway. More often than not, the clothing I’ve bought fits and is suitable, but there have been times that a garment was not meant to be bought by me – so I just donate it back to the store. I believe I have NEVER seen any article of clothing made in Canada, except perhaps some Olympic memorabilia. What manufacturing is Canada known for? Besides crystal head vodka? Oh my American public school education! The handcrafted link did not work for me but I am going to look around and read more here anyhow. hmmm funny I have the same list of 5 things. lol. Haven’t been to kensington market yet – I do hear great things! PS. the sweater looks fabulous on you. great find. love the little red birdie. Very cute, and she (you) look happy in the snow! I had a sweater similar to that in high school–I think my yearbook Jr. picture was taken in that Joan Jett looking thing! love that! all the cool kids had sweaters like this (i didn’t. i think mine might’ve had reindeer or something on them)… you should dig up that photo shara! and the answer to #5, well, for me? probably not. makes for some awkwardness when i answer the door. no no googs! you were right the first time. i was just trying to squeeze in as much 80’s into the post as possible. tulle hair bows – acid wash jeans – miami vice – virgin bracelets. there i feel better. now about the other thing you mentioned… do i have to make you a mixed tape? ;) please tell me you’ve at least heard of rush? let’s talk more about this over coffee at your indoor cafe yes? I love you , Ima. That is all. Pants – check. Shoulder pads – nadda. Lol cute top! I’m from Port Hope, so I remember Kensington Market well! Great sweater btw, amazing that it was made in Canada. AHHHHH!! I LOVE it (well, the bit I can see anyways)! And now I totally have to check out that yarn shop! Pingback: recipe: apple crumble | i made it so.